Hey LC.com readers! It’s Royale here again from But First, Party!. 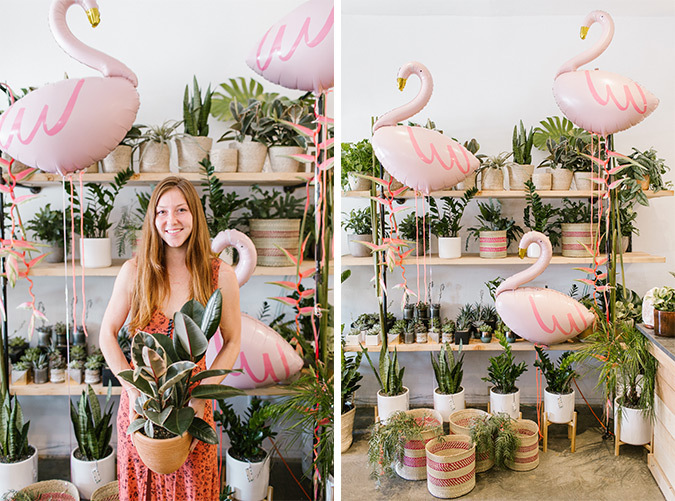 When our friends over at Wildflora Design (you may remember their show-stopping faux floral installation from our Pink Candyland Christmas) opened up their second storefront in West Hollywood, we could not wait to attend one of their famed workshops! 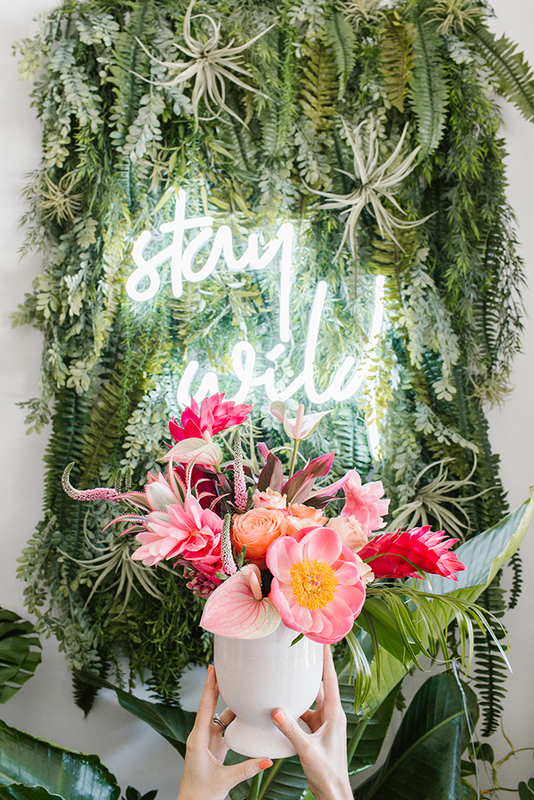 To us, nothing says summer like palm leaves and tropical flowers. 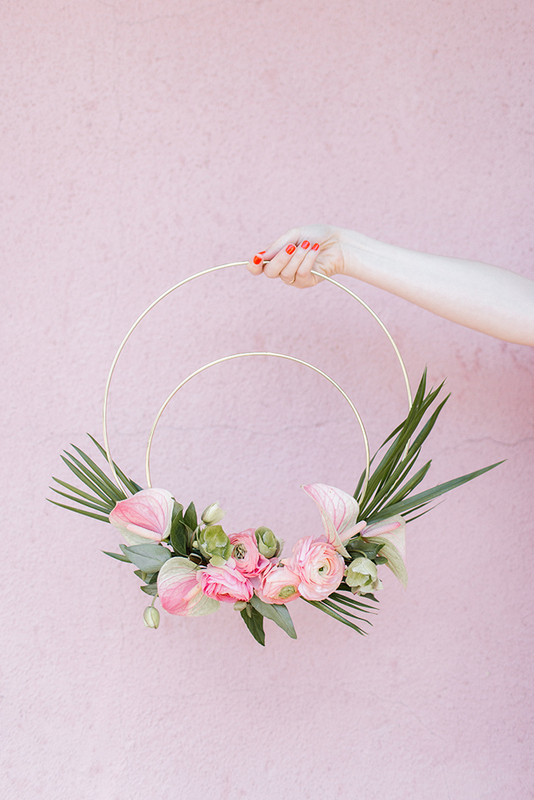 So naturally, we were all for attending a Wildflora summer wreath-making party! 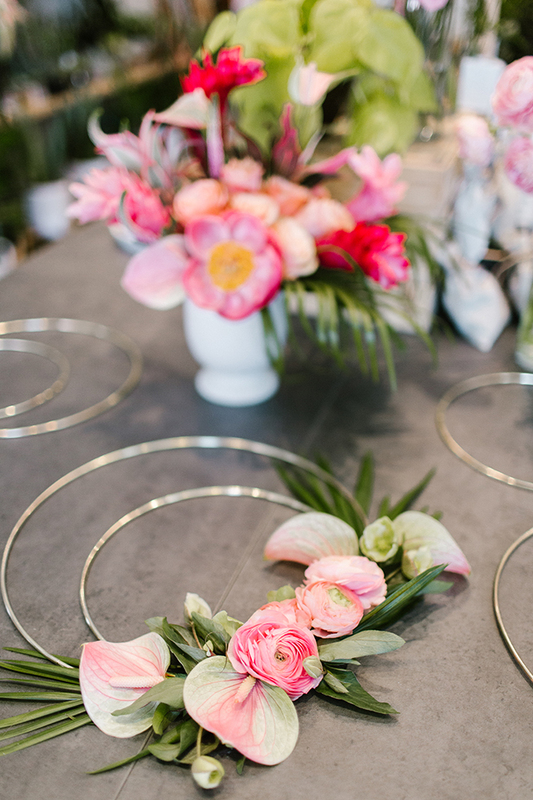 We could not have been happier when we arrived to see the setup, including delicate golden rings and bright pink flowers to decorate them with. 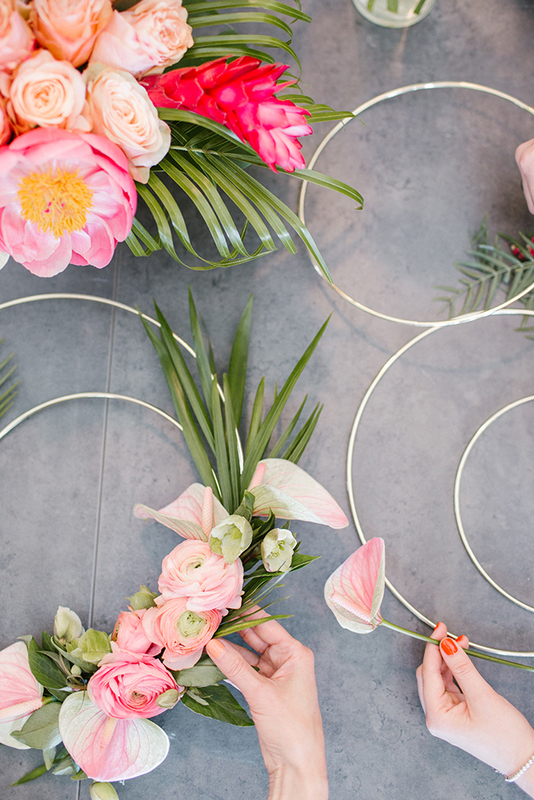 Shop owner Alex was so great and patient with our slow-going wreath-making, she even created the most stunning sample wreath to help us get started. To be fair, our wreath making game may have been hindered by the spread of delicious treats Lauren Lowstan made… I mean, how is one supposed to concentrate with cake around!? And what a cake it was! 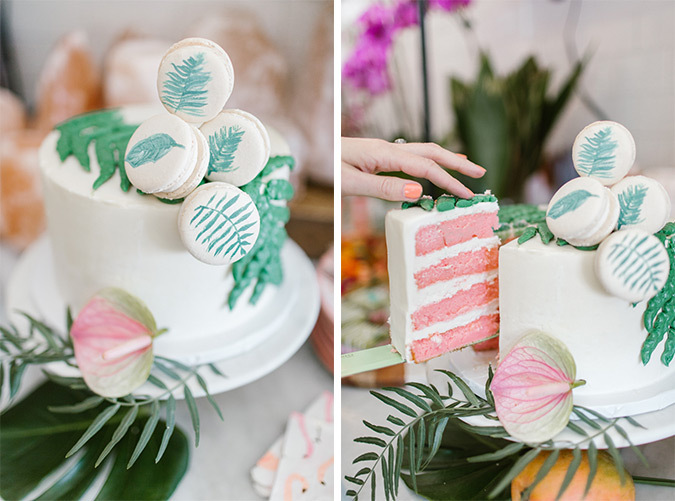 This may have been my favorite Lowstan creation to date, with palm frond detailing and a macaron tower that we “built” using floral wire. The best part? A pink strawberry middle! 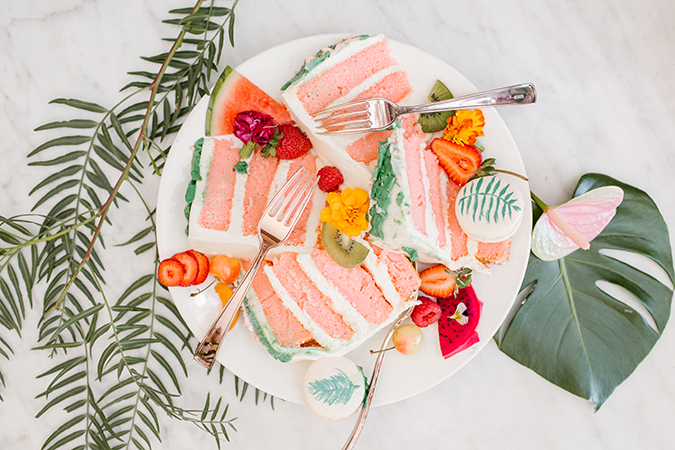 You really cannot go wrong with pink cake, like ever. 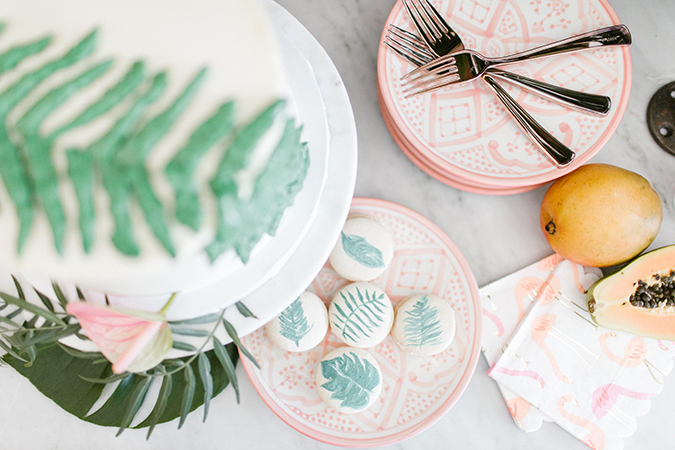 And doesn’t The Little Market’s line of blush Moroccan ceramics complement those palm leaf macarons so perfectly? 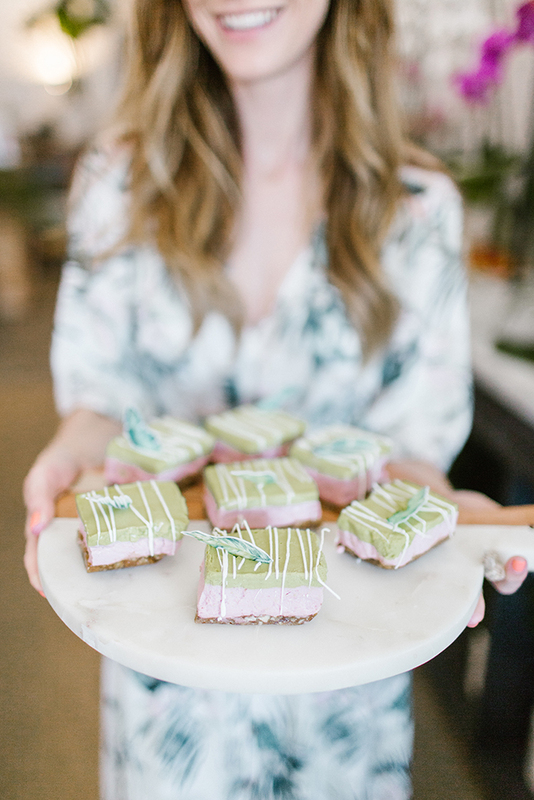 Equally stunning and delightful were her raw cheesecake bars, topped with edible palm leaf sprinkles (stay tuned for the recipe coming later this week). 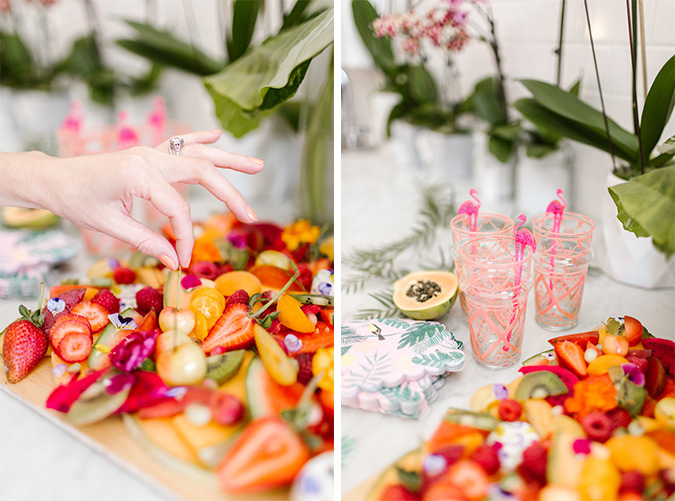 All of the treats paired perfectly with the summer fruit graze board the Sorella Collective ladies prepared for us. So much pretty! Let’s talk about the space itself, because it could not have been a brighter and more gorgeous place to host a girlfriend’s afternoon. 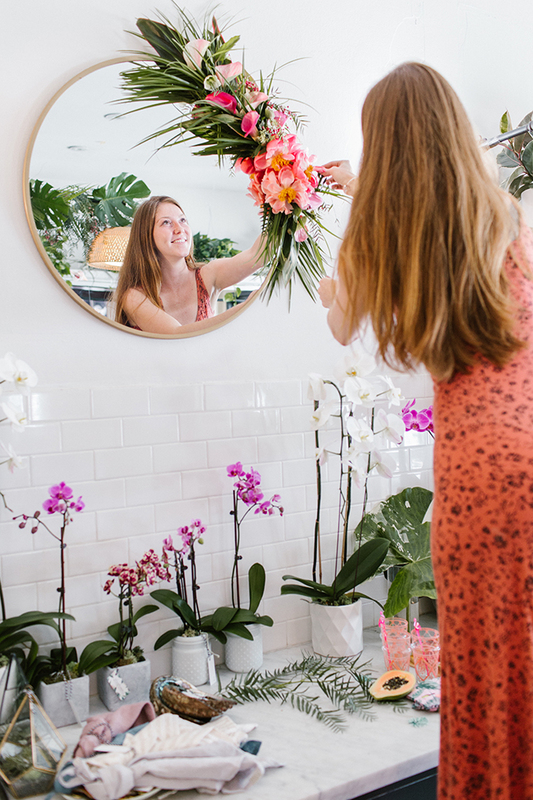 Alex created beautiful tropical details, like a leafy installation on her basket-weave lighting and a sweet little swag around the mirror. 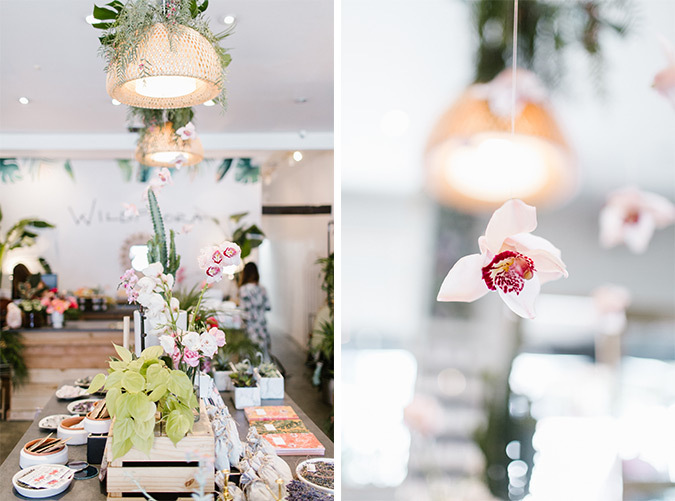 Not to mention that the entire store itself was covered in tropical flower and greenery. There were even delicate orchids hanging from the ceiling! Of course, it wouldn’t be a But First, Party! 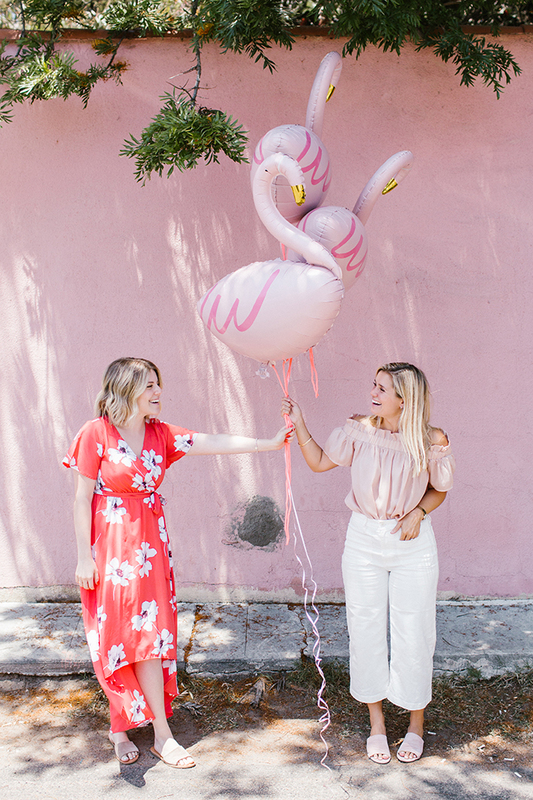 celebration without balloons—especially when the balloons are giant pink flamingos from Meri Meri! How amazing do they look against that plant shelving (featuring hot pink woven baskets from The Little Market)? 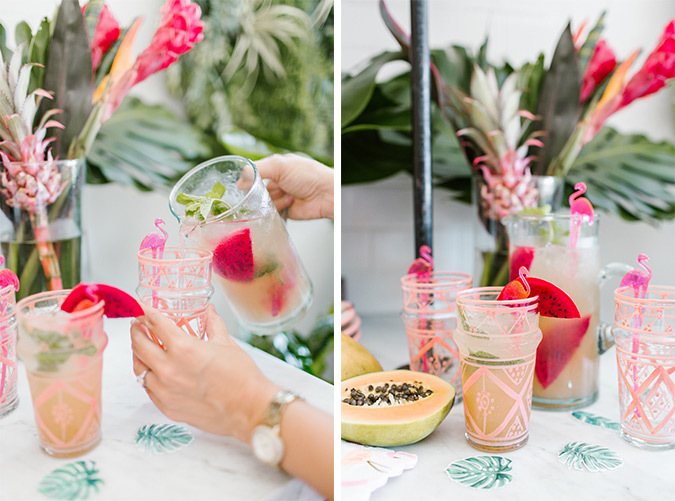 Speaking of The Little Market, we put their blush Moroccan glassware to good use, creating guava mojitos with dragon fruit garnishes and flamingo cocktail stirrers. It tasted just like summer. Cheers! 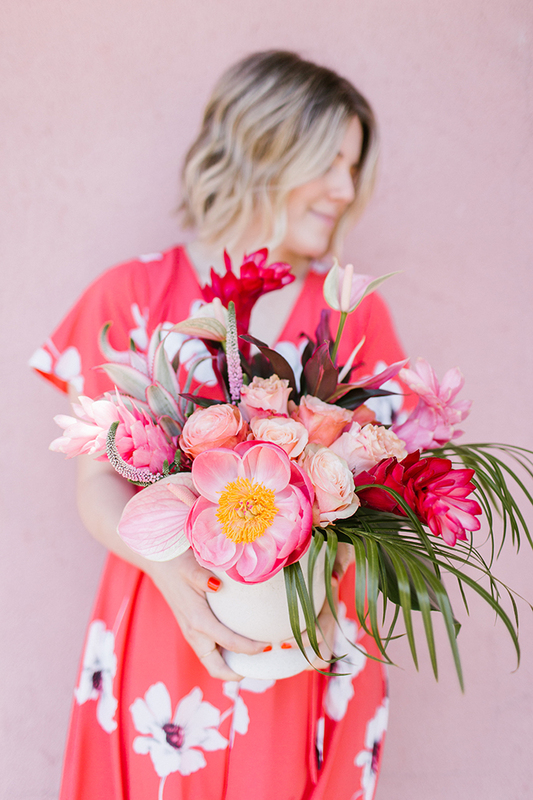 What’s your favorite theme for a summer soirée? Let me know in the comments below! Also, if you have any fun themes or requests for future party planning posts, I would love to hear about your ideas. Party Styling: But First, Party!